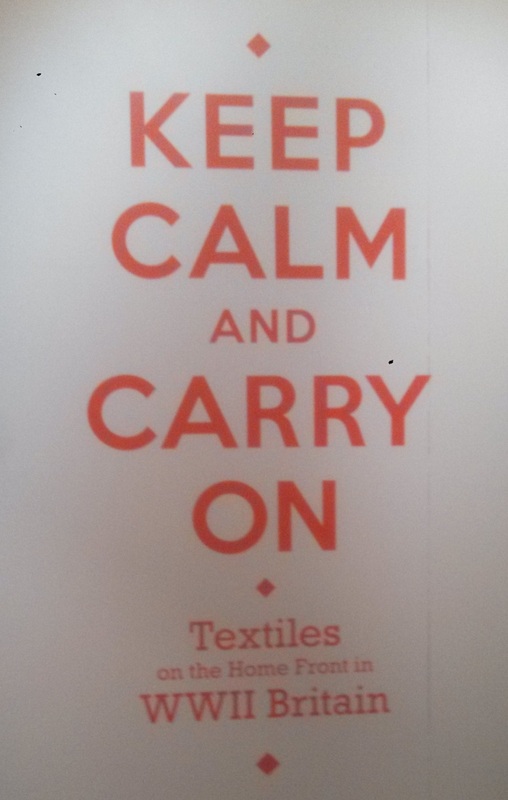 On September 29th the Illinois Holocaust Museum opened its newest temporary exhibit, Keep Calm and Carry On: Textiles on the Home Front in WWII Britain, a traveling exhibit from the Museum of Fine Arts, Boston. 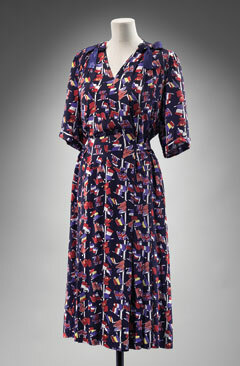 The exhibit explores the use of textiles during the war years, specifically propaganda scarves and government regulated clothing, to tell a story of rationing, propaganda, and patriotism. The final sentences of the introductory panel beautifully sum up the thesis of the exhibit: “During a decade of extreme hardship and deprivation, these bright colored scarves and smart fashions were enlisted in the battle to keep spirits high. Beauty — in measured amounts — was not frivolous, it was a patriotic duty.” Utilizing a broad range of artifacts from textiles and furniture to fashion magazines and oral histories, this brightly colored exhibition provides an upbeat and invigorating contrast to the somber permanent exhibit of the museum. Upon entering the exhibit the visitor is confronted with a fairly open floor plan: panels and artifacts are, for the most part, along the walls while the middle of the space is taken up by a rectangle of moveable walls, each side of which features a different film while a larger-than-life portrait of Winston Churchill presides over the entire space. This floor plan allows the visitor to easily move between the different sections of the exhibit, each of which fits into the overall narrative, but can also stand alone. The scarves are, undoubtedly, the biggest draw of the exhibit. The section label outlines how brightly colored propaganda scarves were created, without government influence, by fashion firms throughout these years and also begins to explore the issue of rationing. Whether the visitor is one to read labels or not, he or she will undoubtedly be drawn to the text of this exhibit in order to find an explanation for a vivid print featuring Winston Churchill or a scarf emblazoned with practical advice. The section on the rationing of clothing uses well-written text to explain and artifacts to demonstrate how the British public coped with this shocking wartime measure. Government launched utility fashions, easiest to purchase under the clothes rationing system, were designed by top British fashion designers. These measures allayed fears of standardized “civilian uniforms” and made fashionable clothing available to a broader spectrum of British society. Even visitors who do not read the section or individual labels here will learn about rationing through viewing or hearing the “Rationing in Britain” video. The only one of the four central videos to be accompanied by sound, “Rationing in Britain” outlines a day in the life of a typical British family dealing with the hardships of the rationing system. This intriguing video was actually produced by the British Ministry of Information during WWII and has that old propaganda video feel that can’t help but draw in viewers. The other videos featured in the center area provide context for the exhibit as a whole. These videos, which do not have accompanying sound, feature photographs and videos along the themes “Britain at War,” “The Blitz,” and “Victory…One Year Later.” Through the use of these videos, the realities of the war are never far away, even though the exhibit itself focuses on issues that specifically affected those at home. A fifth video, screening in its own alcove in the corner, connects the British home front experience and the experience of the American serviceman. This video, which features an interview with Arthur Fishtine (an American GI during WWII) as well as photographs and videos, showcases how British textiles were bought by American servicemen as well as by British women seeking to impress these young Yankee soldiers. Whether you are a first-time visitor or a member, Keep Calm and Carry On will without a doubt be a “memorable” addition to any visit to the Illinois Holocaust Museum now through January 26th.